The Silk Road, that ancient and mystical trade route that brought Asian silks and spices all the way to Europe, has long been the subject of story and song. But now, a new initiative by the Chinese government aims to revive the Silk Road’s storied route in a bid for Eurasian supremacy that both challenges the West and promises to open new doors for investors around the globe. Chinese president Xi Jianping announced the New Silk Road Initiative in 2013 – an ambitious project that would create an unprecedented economic corridor that would eventually link Asia, Europe and Africa, with benefits for all the countries and regions along the route. Among the key parts of the proposed plan: high speed railroads, massive infrastructure repair and development, pipelines and other conduits for energy, new distribution and shipping facilities and an array of support facilities all along the Road. But the plan doesn’t stop there. 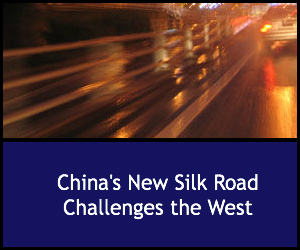 China’s initiative also calls for a maritime version of the Silk Road – shipping lanes that would connect China with the Mediterranean Sea and Persian Gulf via the Indian Ocean. To prepare for the New Silk Road initiative, in 2014 China established the Asian International Infrastructure Bank, an institution dedicated to providing startup money for the project. China itself put up $40 billion to launch the bank, and quickly began recruiting other members from the global community. In less than a year, the AIIB has gathered significant support. Most Western European countries are on board, along with many in Asia and even the World Bank itself, all drawn by the promise of economic benefits not just for the region but also for the world, far into the future. For all these areas, the New Silk Road promises to pump new money into local economies, improve rural conditions, advance education and create jobs. It appears to be a win win situation for all parties. But not everyone is on board – and some economists and global market watchers fear that China’s move to create such a multinational initiative is the opening salvo in a war for supremacy in Eurasia. China is already a leader in foreign investment and gold trading, and some worry that its dominance will eventually dethrone the US dollar as the standard for global currency trading. That means the New Silk Road plan promises major changes in the geopolitical landscape of the whole region, as other countries jockey for their own dominance in a new world of global trade opportunities. Needless to say, the US has not signed on as a member of the AIIB. When the New Silk Road project was originally announced, the US actively opposed it – but later reversed its rhetoric to say that it endorsed it all along. But now a number of America’s NATO partners have jumped on board, along with key allies in the region Australia, South Korea and New Zealand. In order to maintain influence in the region, the US has proposed its own version of a multinational trade alliance, calling in the Trans Pacific Partnership. But while the proposed pact claims to be “trans pacific” it excludes both China and Russia, both of which have a strong presence in the Pacific region. India, too, is coming up with its own trade initiative that would expand development and increase trade throughout Eurasia. Plus, plans for involving Iran in the new economic corridor would violate US-led sanctions against that country. As a recent article from Business Insider points out, China’s plan is a game changer, unprecedented in scope and ambition. But regardless of the stance taken by US officials, the New Silk Road will need US-made technology and equipment, as well as an international team of experts in many fields. That means new opportunities for investment and entrepreneurship in areas all along the corridor.